A Lecture for the students of San Diego State University "SDSU" on March 1, 2016 from 5:30 to 6:45pm on the campus. I am very honored and excited to have spoken to the students of San Diego State University on Tuesday, March 1, 2016 from 5:30 to 6:45 about ART and the PATH that it has carried me upon since I was a small child. The evening was was filled with great conversation and lots of learning all around. I look forward to returning to work with the students at SDSU again soon! 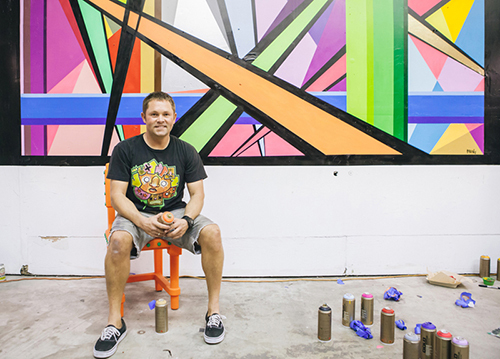 “Muralist, Street Artist, Entrepreneur Monty Montgomery will be our speaker on March 1st, 5:30-6:45 GMCS-333 on the SDSU campus. Monty is one of the most enthusiastic and generous people I have ever met. He is also one of the busiest artists on the planet and I have been trying to arrange him to speak for over a year. (He leaves the next day for a project in Costa Rica!). His work is a reflection of his love for life and his sympathetic reaction to his immediate environment when working on a project.